Once upon a time, Allegra Benitah didn’t have the energy to get a proper dinner on the table, let alone express herself through food. A University of Cambridge graduate, she had been working crazy hours as a tax lawyer at London firm Clifford Chance for five years, her days largely taken up by numbers, legal clauses and traffic jams. 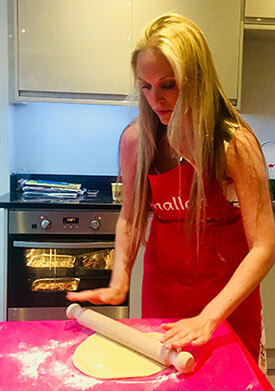 It wasn’t until she had her first child, Ezekiel, who is now 4, that she decided to leave her job and become a full-time “mummy.” Two years ago, she and husband welcomed daughter Neroli. It was at a challah-baking workshop at her son’s school that Benitah discovered her natural talent for preparing the bread. Today, she goes by the internet pseudonym Challah Mummy. 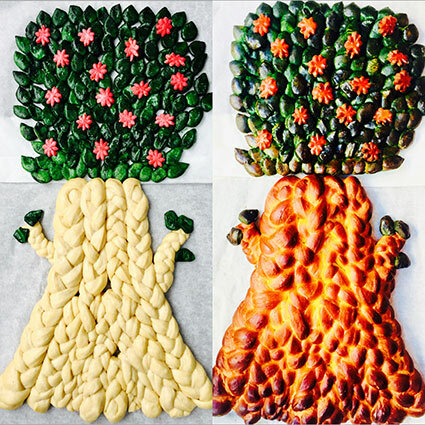 Her blog and Instagram page show off her intricately designed and flavored challahs (hats, baskets, crowns and hamsas; strawberry and blueberry, apple and cinnamon). 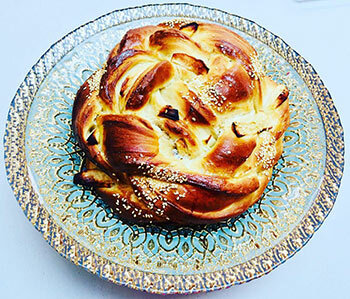 She shares her skills through workshops—held both in her home several times a week as well as in primary schools—and fields frequent requests for special-event challahs. Rebranding the traditional weekly chore in the Jewish household as “good old-fashioned fun,” she refers to each blog post as an “adventure” in different shapes, bright colors and intriguing tastes. And she loves to indulge her creative side, with posts ranging from a challah that contains homemade elderflower cordial shaped into the word “elder” to one formed to look like a tree with bursting with ruby-red pomegranates and green leaves. As with most avid cooks and bakers, Benitah finds inspiration through travel. 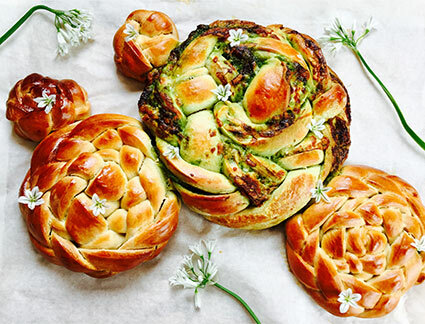 “A favorite of mine is my wild garlic challah,“ she tells me. She developed the recipe after a family trip to East Cork, Ireland, where they foraged for wild garlic. The garlic was put to delicious use in a pesto, with which she stuffed her challah that week. Something we should all strive for as “mummys”! Pour the water into a bowl, add a teaspoon of sugar and dissolve the yeast into the water. Once bubbles start to appear on the surface of the water, add about a third of the flour, followed by the eggs, the rest of the sugar, the salt and the sunflower oil. Get your hands into the dough and combine the mixture, adding flour little by little as you go, until you get a big ball of dough that doesn’t stick to your hands (you might not need all the flour—just see what your dough needs). Sprinkle a clean work surface with flour and knead the dough for 5-10 minutes, adding a bit of flour if it gets too sticky again. Place the dough in a lightly oiled bowl, cover with cling film and leave to rise for about an hour and a half or until it has doubled in size. Make the apple compote: peel, core and slice the apples and place them in a saucepan with the sugar on a low heat to cook. Stir often and add a teaspoon of cinnamon as the apples start to soften into compote. Once dough is risen, knock it back down to take the air out and then roll it out on a floured surface with a rolling pin so it becomes a thin, long and flat rectangle. Using a sharp knife, cut the dough into 3 long strips of equal width (minimum of 4-inches wide). Cut a thin line down the length of each strand that doesn’t go all the way through the dough. Use a teaspoon to fill the cut-out lines with apple compote. Pinch up the dough around the sides of the filling and seal with your thumbs so that you have a long piece of challah dough filled with apple compote. Once you have 3 filled strands, attach them together at the top and braid into a 3-strand braid. Wind the braid into a circular swirl like a snail shell. Leave the shaped challah to rise again for 30 minutes under a clean cloth or cling film. Brush dough with egg white wash and sprinkle sesame seeds along the top, if using. Bake the challah toward the bottom of the oven for 25-30 minutes. Preheat oven to 350 degrees. In a large mixing bowl, dissolve the yeast with a teaspoon of sugar in the lukewarm water. Once bubbles start to appear, add about a third of the flour, followed by the eggs, the rest of the sugar, salt and sunflower oil. Get your hands into the dough and combine the mixture, adding flour little by little until you get a big ball of dough that doesn’t stick to your hands. Sprinkle a clean work surface with flour and knead the dough for 5-10 minutes, adding a bit of flour if it gets too sticky. Place dough in a lightly oiled bowl and cover with cling film; leave to rise for about an hour and a half, or until dough has doubled in size. While the dough is rising, prepare the vegetables for the tart. Blanche the asparagus in salted boiling water for 2-3 minutes. Cut the tomatoes in half, scatter them on a baking tray lined with parchment and drizzle with the olive oil; roast for 30 minutes in the preheated oven. Once the dough has risen, knock it down to get the air out. Roll the dough out into a long and flat rectangle on a lightly floured surface. Using a sharp knife, cut 3 long thin strips of dough (about 1 to 2 inches wide); out of the remaining dough, cut out a large rectangle. Attach the ends of the 3 long strips of dough together and braid them into a 3-strand braid. Then wind the braid around the edges of the flat dough rectangle like a frame around a picture. This will give you the base for the challah tart. 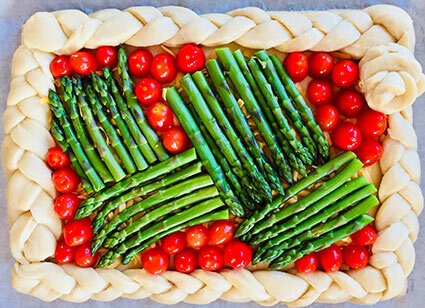 Have fun arranging the asparagus and roasted tomatoes in the center of the tart. Let the challah tart rise again for 30 minutes, covered with a clean cloth or cling film. Brush the challah with egg white wash, drizzle the vegetables with additional olive oil and sprinkle the basil and oregano on top. Bake the challah toward the bottom of the oven for 25-30 minutes. It’s very likely that, as a British cook, Ms.Benitah’s original recipes were given in metric weight measurements. Could you please print those also as a favor to those of us who bake by weight, rather than volume? I couldn’t agree more. Metric weights are the best when it comes to baking, whether it is bread, cake or cookies. Please also remember that flour is milled differently in the UK than it is in the US and cake and bread recipes do not cross the pond well without significant tweaking. I am British and spend a good deal of time in the UK. I also like to bake and always make my challahs when in the States but would never consider using anything other than a British recipe while in London.